Last month we looked at SteelSeries’ fantastic Arctis 5 surround sound headset, but now we’re looking at the top-tier headset in that product family, the Arctis 7. 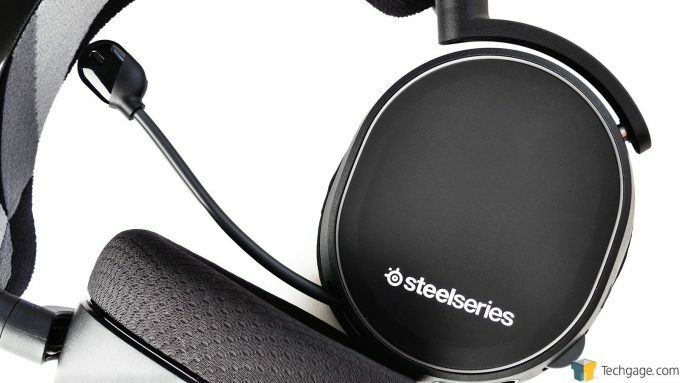 Knowing how well its little brother performed along with how much we liked the last wireless SteelSeries headset that we tested, means the Arctis 7 has some big shoes to fill. 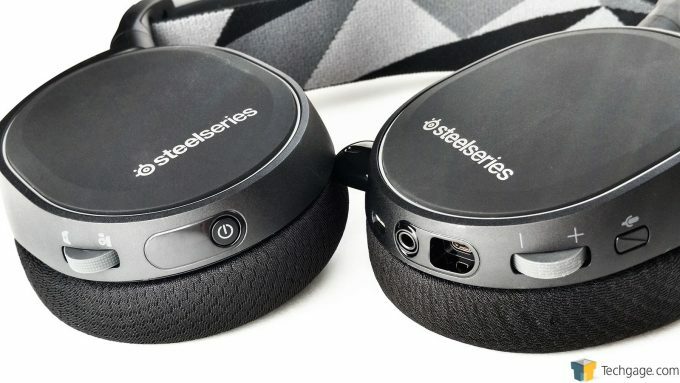 Based on how well the Arctis 5 performed in an earlier review, it appears that SteelSeries can do no wrong with this product lineup, but here at Techgage, we don’t take things at face value. The Arctis 7 boasts some serious features aimed at those who want the best wireless headset possible, and we’re here to see if it can live up to the hype. 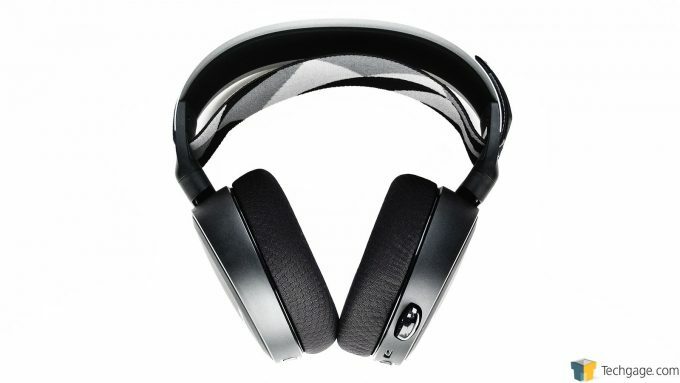 While this model does share some similarities with the Arctis 3 and 5, there are a number of features exclusive to the 7, with the major draw being lag-free, wireless connectivity. Read on as we break down this headset by looking at the core features, and then run it through the same tests as the Arctis 5 to see how it stacks up. Like the other models in the Arctis lineup, the Arctis 7 is compatible with PCs, Macs, consoles, and mobile devices. It comes in either black or white, but drops the Arctis 5 RBG accents on the outside of the cups to help extend the battery life. The wireless range is listed as 12 meters or 40 feet, and battery life is advertised at 15 hours, while the charge time is one specification that’s strangely absent. 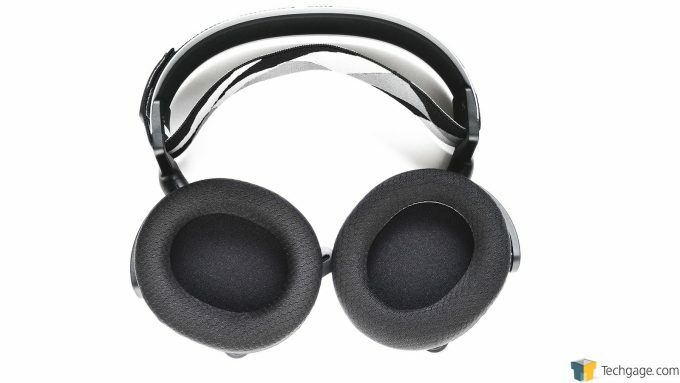 The AirWeave padding around the cups is featured across the entire product line, however there are leather ear cushions sold separately if a smoother feel is preferred. Also returning are the high performance SP1 drivers that deliver DTS Headphone:X 7.1 surround sound straight to your ear holes (A scientific term… probably). This time around the on-ear controls have been expanded and split between the two cups. The right cup houses the illuminated power button and the ChatMix dial used to balance in-game and incoming voice chat volumes. The left cup holds the mini-USB charge port, audio share port, console/mobile cable port, volume dial, and microphone mute button. The controls start at the bottom of each cup and curve up the around the back slightly so that they are in line with the thumb or fingers for easy access. Also returning is the Clearcast bi-directional, noise-cancelling microphone. It sits at the edge of the mouth when extended, but can be tucked into the left cup when not in use. Like before, the illuminated top section glows red when the mic is muted, and will slowly fade in and out when the headset is charging. The headband design of the Arctis 7 is unique to this model in that it’s a full wrap headband compared to a half wrap found on the other models. This means that the soft, ski goggle-like material of the headband wraps the entire way around the inner metal headband that supports the cups. 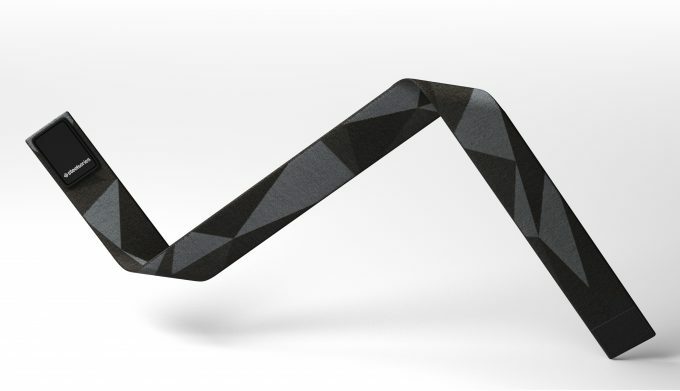 At no time does this metal part contact your head so the stretchy bits of the headband wrap support the weight. Sizing is again handled by a Velcro-like pad, and there are different designs available separately for this model as well. 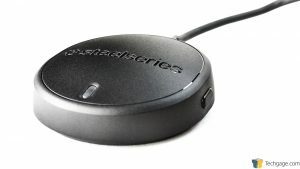 Wireless connectivity between the Arctis 7 and a PC, Mac, or PS4 is handled by the Dual Source Audio Transmitter, and is about the size of a small cookie. Along the right side is the sync button used to pair the headset, and in the middle is a small white LED that indicates connectivity. 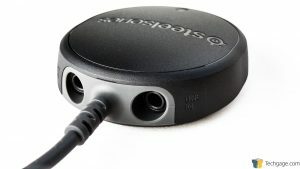 On either side of where the roughly 4′ USB cable connects is the line in port that can be used to connect a second audio source, and the line out port that allows audio to be played through another device such as a speaker system. The audio will go to the headset when it’s powered on, but when powered off, the audio will go to whatever device is plugged into the line out port. 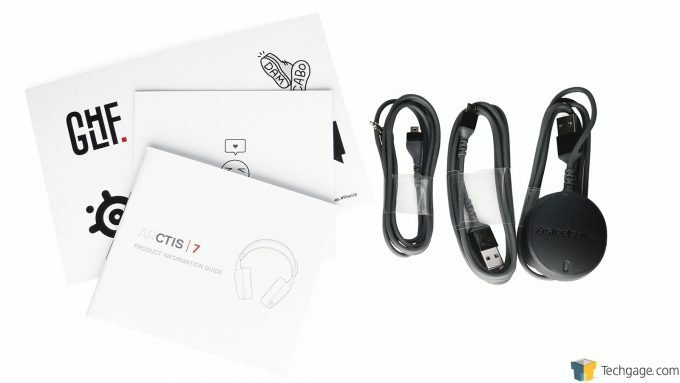 Included with the Arctis 7 is another strange assortment of stickers, a card with a few links to SteelSeries’ social media accounts and the URL for support, and a product information guide. The cables included consist of the console/mobile audio cable (sorry Xbox and mobile users – you’re wired), the mini-USB charge cable, and the USB receiver. 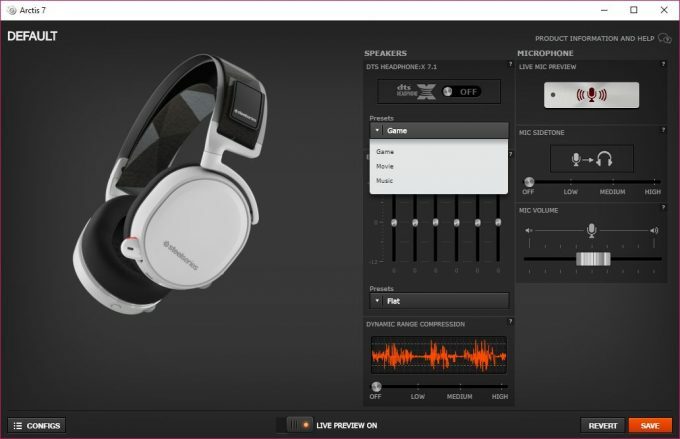 The software interface for the Arctis 7 is again handled by SteelSeries’ Engine 3, which acts as a management hub of sorts, where all supported peripherals can be accessed and tweaked. The UI looks sparse compared that of the Arctis 5, but that’s because RGB support has been dropped on this model. Users can enable DTS Headphone:X 7.1 surround sound and choose from a few presets depending on the activity. You can tweak the EQ or choose from a set of separate presets, and change the amount of compression (dynamic range) to make the quiet parts loud and the loud parts quiet.